Dynamin 1. Our recognition of DNM1 encephalopathy as a novel disease started out as a digital flicker. Deep inside some of the large-scale studies in epilepsy genetics, there were a few patients with de novo mutations in the gene coding for DNM1. However, amongst all the other likely and less likely candidates, it took a while for DNM1 to emerge as a true candidate. But even then, being a disease gene born out of large-scale studies with little information on clinical presentation and disease course, we had learned little about how patients with DNM1 encephalopathy actually present and how they develop over time. In our recent publication in Neurology, we describe the spectrum of DNM1 encephalopathy, including an unusual mutational landscape and the first genetic cause in a patient with FIRES. Dynamin 1. Most of the disease-causing mutations in DNM1 cluster in the GTPase domain, where they affect the GTP-catalyzed multimerization of DNM1 that leads to synaptic vesicle fission. These mutations have a dominant-negative effect, suggesting that the altered DNM1 protein affects the function of the remaining DNM1 protein. Dynamin 1 function. When synapses release their neurotransmitters, they rely on a sophisticated machinery that initiates and completes the fusion of the synaptic vesicle. Many of the newly discovered genes for neurodevelopmental disorders including STXBP1, SNAP25, STX1B, and CPLX1 encode proteins that are involved in this machinery. However, once vesicle fusion is completed, the neuron encounters a fundamental biophysical problem. With every fused synaptic vesicle, the surface of the presynapse increases slightly. Therefore a mechanism is needed to recycle synaptic vesicles. This is where the dynamin 1 protein comes in. Dynamin 1 molecules form a noose around the base of the vesicle that is is drawn tighter and tighter until the vesicle pops off – this mechanism is called vesicle fission. This should not be confused with vesicle fusion, which describes the step of merging the vesicle with the presynapse. Dynamin 1 basically acts as a molecular scissor. In order to generate sufficient force to complete this task, Dynamin 1 is dependent on the hydrolysis of GTP. 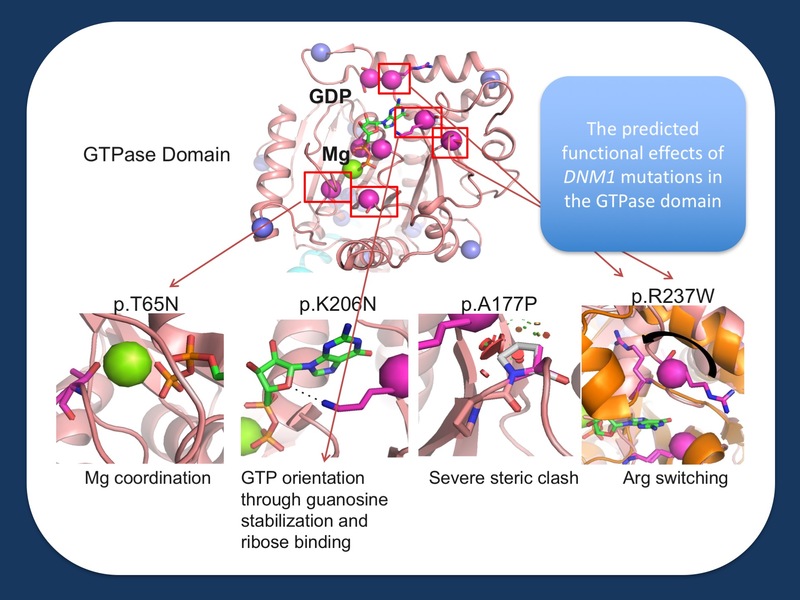 Mutations in DNM1 that we have seen in patients often affect the GTP-binding domain and lead to a dominant-negative effect. The DNM1 spectrum. Overall, we were able to include 21 patients with pathogenic (most de novo) mutations in DNM1 in our study. 19/21 patients had epilepsy, which was difficult to treat in most patients. Infantile Spasms starting at the age of around six months were the most common presentations of DNM1 encephalopathy. Only two patients in our study became seizure-free, including one patient who became seizure-free on clobazam and one patient who became seizure free on the ketogenic diet. Of the subset of patients who we followed into young adulthood, all patients continued to have drug-resistant epilepsy. This feature differentiates DNM1 encephalopathy from many other genetic epilepsies as only few genetic epilepsies show such a protracted course over time. The genetic landscape. When we looked at the mutational landscape of DNM1 encephalopathy, we were surprised to find that a single mutation (p.Arg237Trp) accounts for approximately one-third of patients. Given that our previous studies indicated that DNM1 encephalopathy accounts for up to 2% of patients with Infantile Spasms or Lennox-Gastaut Syndrome, this suggests that this single mutation is actually one of the most common mutations in refractory epilepsies. In our study, we found a good explanation for this restricted mutational spectrum. The p.Arg237Trp mutation directly affects the GTPase domain of DNM1, leading to a dominant-negative effect. Basically, the mutated dynamin 1 affects the molecular noose function of the remaining, non-mutated protein. Given that this mutation introduces a block in dynamin 1 function, we speculate that this single mutation may be an interesting candidate for novel therapeutic strategies such as gene therapy approaches. In contrast to many other genetic epilepsies where the disease mechanism is due to haploinsufficiency, dynamin 1 encephalopathy is due to an altered function of the mutated dynamin protein that results in a predicted block of dynamin 1 function. The outliers. Even though the phenotypic landscape of DNM1 encephalopathy is more homogeneous than initially expected, we identified a few outliers in our study. Two patients with pathogenic DNM1 mutations did not have seizures, but presented with developmental delay only. Many neurodevelopmental disorders have a broad phenotypic range and for most neurodevelopmental disorders, presentations without epilepsy may be quite common. Therefore, we were not surprised that DNM1 encephalopathy has a similar spectrum. However, when we checked our DNM1 phenotypic landscape against data from other studies, we were surprised at how common epilepsy in DNM1 patients is. In the most recent publication from the DDD study, which included >7500 individuals with broad developmental disorders, the authors identified 5 nonsynonymous de novo DNM1 mutations. Human Phenotype Ontology (HPO) terms were provided for these individuals, but detailed phenotypic information was not available. In this cohort, also 4/5 patients with DNM1 mutations had HPO terms that include seizures, suggesting that the vast majority of patients with DNM1 patients in cohort of patients with broader neurodevelopmental disorders have epilepsy. In addition, one patient with a novel DNM1 mutation had FIRES (Febrile infection-related epilepsy syndrome) starting at the age of four. FIRES is a catastrophic epilepsy syndrome that is thought to have a genetic basis, which still remains elusive. We have screened known candidate genes for FIRES and are currently coordinating a larger exome-wide study, but to our knowledge, this is the first patient with a known genetic etiology. What you need to know. In summary, DNM1 encephalopathy is a novel genetic epilepsy syndrome that is typically characterized by therapy-resistant epilepsy starting with Infantile Spasms at the age of 5-6 months. In contrast to many other epilepsy syndromes, DNM1 encephalopathy leads to therapy-resistant epilepsy over time, which makes this disease an candidate for orphan drug development. The mutational spectrum of DNM1 encephalopathy is relatively restricted and up to one-third of patients carry a single, recurrent mutation. A dominant-negative effect of the mutated dynamin 1 protein is the pathogenic mechanism behind DNM1 encephalopathy. Disclosure/Open Access. We typically disclose on our blog when our posts may be biased. As I am the senior author on our current publication, this blog post is therefore not an objective review of our publication, but a commentary on our recent work. Our Neurology publication on DNM1 encephalopathy is available as an Open Access publication. We also previously featured DNM1 encephalopathy in our blog posts in 2014 and 2015. This entry was posted in 2017, DNM1 and tagged DNM1. Bookmark the permalink.